When working for an organization, it is expected that the employee should follow all the regulations and work diligently. At times when he needs to take a leave, he is expected to apply for it using a leave application form. In the form, he is required to list his details, a number of days of leave he is seeking, the reason for the leave etc. Since these Application Forms comprise of all the important segments, the employee is only required to fill in the details. As the name indicates, this form is used by companies and business organizations to allow their employees to apply for a leave. The employee is required to fill in the relevant details in the form and then submit it to his boss. An employee who wishes to apply for leave to go on a vacation has to use the aforesaid form for the purpose. In this vacation request form, he may be asked to list the number of extra hours that he may have put in to earn the vacation. You may also see Sample Application Forms. 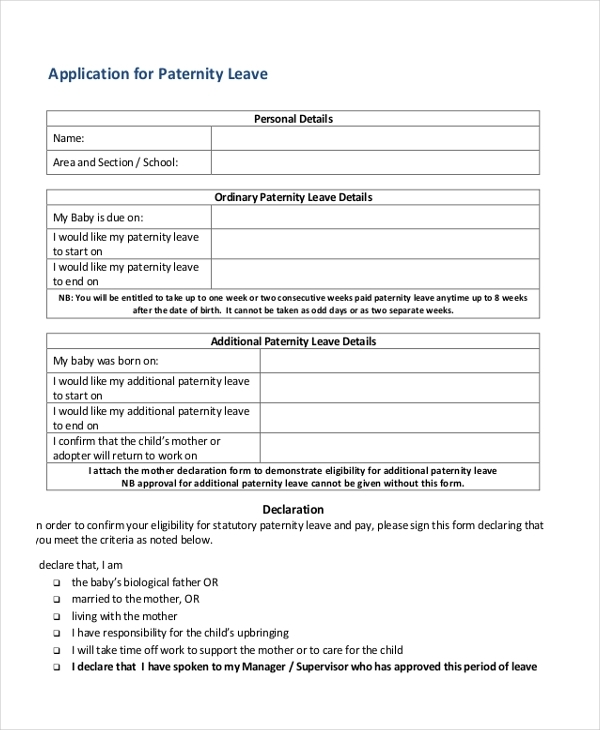 When an employee wishes to apply for a paternity leave, the organization expects him to fill in this form with the details like his name, designation, the number of days of leave he is expecting etc. 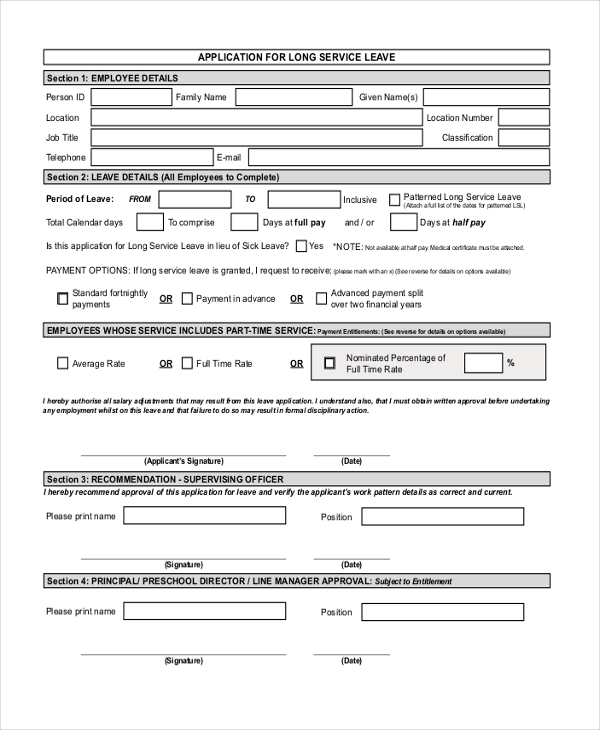 Companies and educational institutions use this form to allow their employees and students to apply for a leave at times when they may be sick. The applicant should, however, offer a doctor’s certificate with this application in order to get the leave sanctioned. You can also see Employment Application Forms. 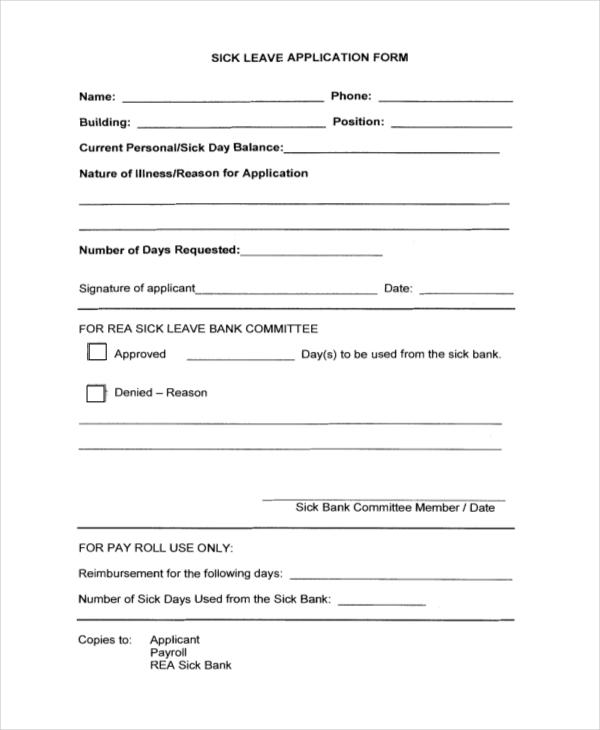 When an employee wishes to take a long leave of absence from his work, he or she needs to fill in this leave application form with the required details like the period of leave, reason etc. 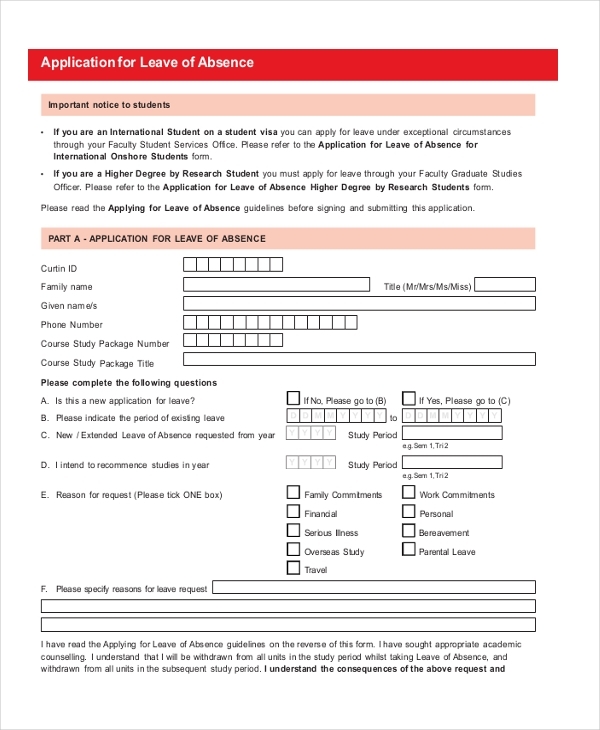 This form is usually used by educational institutions to allow their students to submit an application form requesting for a leave of absence from the class. The student is required to fill in the reason for the absence. 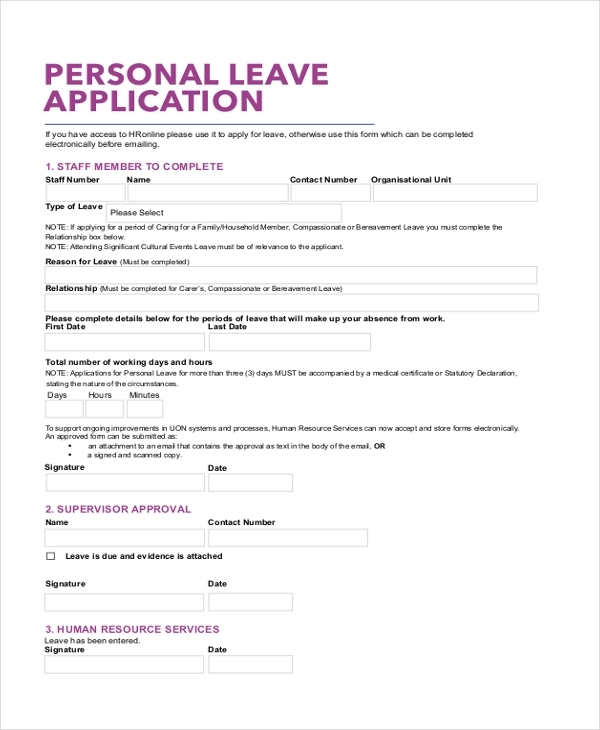 Organizations that offer annual leaves to their employees can use this form to allow them to make a request for the leave. 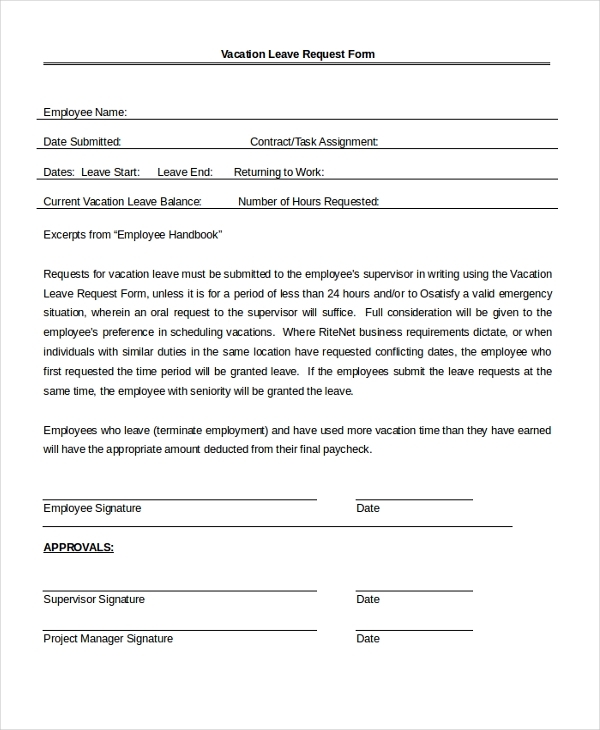 This form comprises of all the essential segments that make it easier for the employee to make the request. You can also see Sample Employment Application Form. 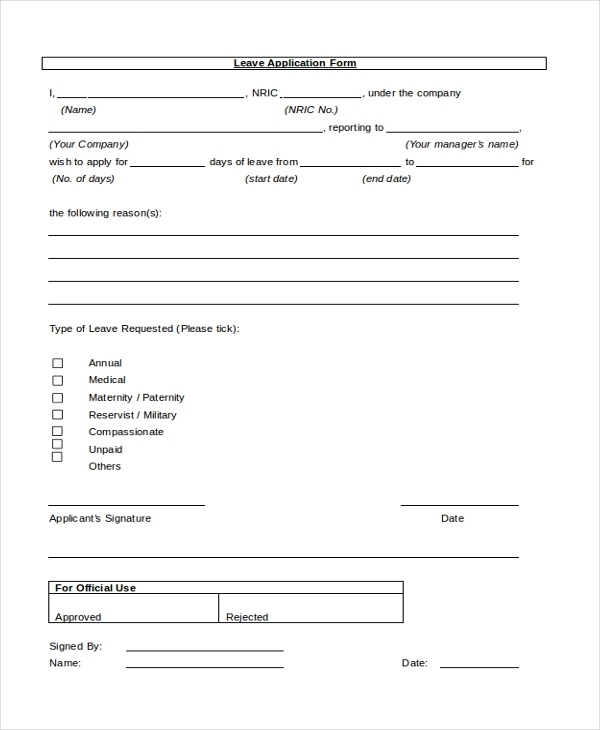 This form can be used by any person who wishes to request a leave from the organization where he works or the college where he studies. This form helps him to draft a highly professional looking application. Organizations use this form to allow their employees to request for a leave to take care of their child. In the form, the employee is required to fill in his personal details as well as the details of the child who is sick. 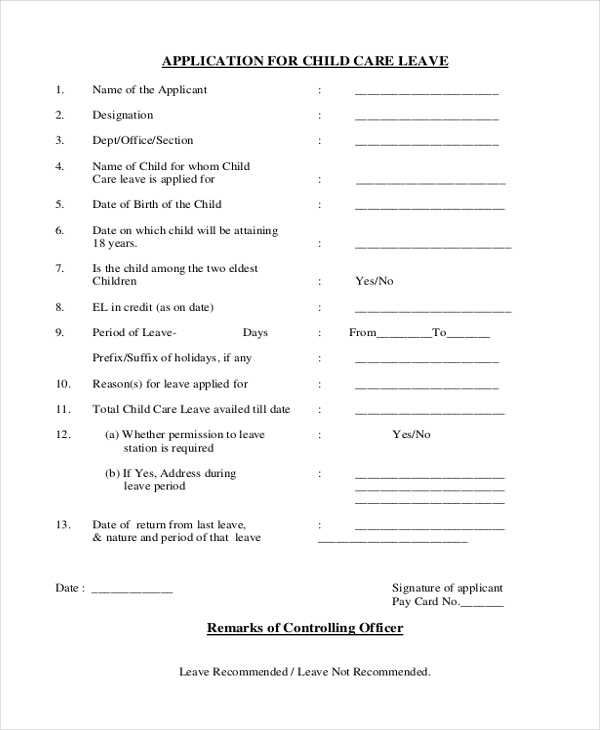 This form is used by educational institutions to allow the parents of their students to apply for a leave on the behalf of their child. 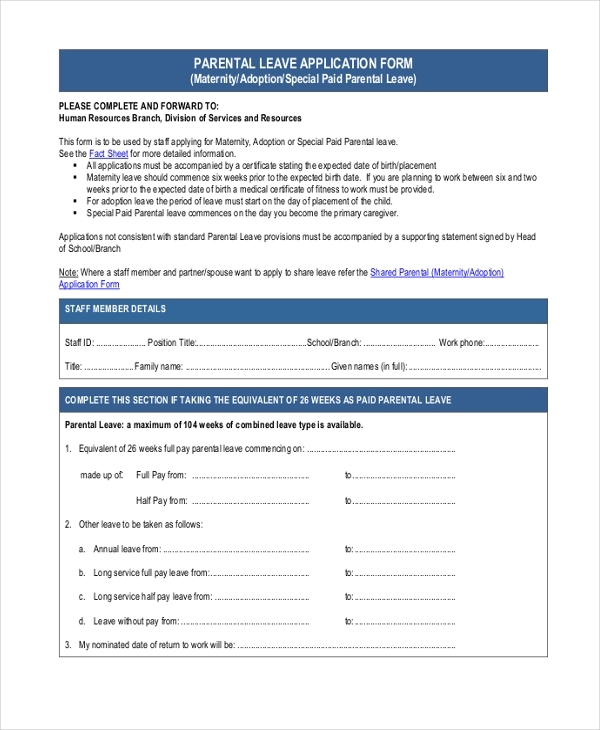 The parents should share the student’s information and the reason for the leave in this form. you can also see Application For Employment Forms. 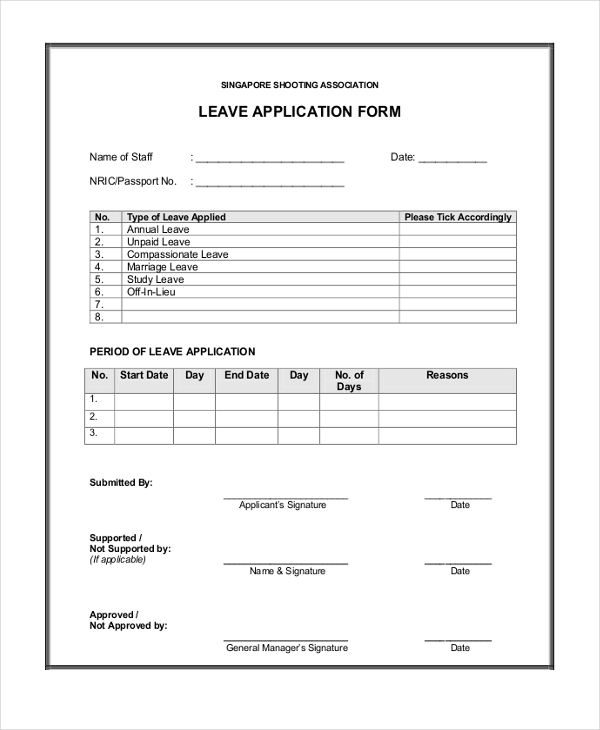 Need some help to design a leave application form for your organization? Check out our collection of these forms and select the one that is apt for you. Easy to download and customize, these forms are available in MS Word and PDF format and are an ideal choice. You may also see Job Application Forms.